As thousands of UC Berkeley students, both familiar and fresh, returned to campus last week, staff were busy putting the finishing touches to scores of newly renovated classrooms in readiness for the fall semester. The renovation of 37 general-assignment classrooms in 10 buildings — Barker, Barrows, Evans, Hildebrand, Latimer, Leconte, Tan and Wurster halls and Donner Lab and Genetics and Plant Biology — targeted improvements in functionality, aesthetics and comfort. In Latimer Hall, fixed seating and a lack of technology made several classrooms unsuitable for evolving instructional needs. “We are constantly looking for ways to improve the quality of the educational experience for our undergraduates and provide our faculty with the support that will help them succeed in the classroom,” says University Registrar Walter Wong. Managed by the Office of the Registrar through the cross-campus Classroom Study Group, the work covered upgrades to seating and writing surfaces, interior finishes, lighting and acoustics. Improvements also addressed technology and ADA-accessibility issues in several buildings. Old furniture, fixtures and fittings were repurposed, donated or recycled where possible. The renovation of nine remaining classrooms, planned for the upcoming winter break, is scheduled for completion by January. In terms of pure functionality, 121 and 122 Latimer Hall — small classrooms adjacent to the sprawling lecture auditorium in the 49-year-old chemistry building — underwent the most dramatic transformation. 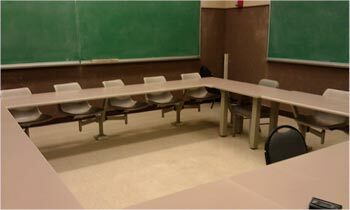 Previously, the box-style rooms were used primarily for discussion sections due to the constraints of their configuration and lack of technology infrastructure. They now have new, ergonomically designed, mobile tablet-chairs that feature adjustable writing surfaces, elbow rests and under-seat storage bins mounted on casters for 360-degree rotation. Modern flexible-use classrooms replaced outmoded spaces in Latimer. The flexible seating solution supports seamless transition from lecture to group work, while effectively increasing the usable space and capacity of both rooms. A 65-inch wall-mounted flat-screen monitor calls attention to newly installed instructional technology. The current round of classroom upgrades continues an ongoing campus effort to enhance the educational experience for instructors and students alike. The Berkeley campus houses 216 general-assignment classrooms in 35 buildings, and the Registrar’s Office worked in conjunction with L&S Facilities to improve common spaces in heavy-traffic buildings. In Evans Hall, which was built in 1971 and houses the departments of economics, mathematics and statistics, crews laid slip-resistant floor mats, upgraded lighting, refreshed wall finishes and ceiling tiles and installed hallway benches. 102 Wurster as it was before the much-needed makeover pictured at the top of this story. The Registrar’s project principal, Pamela Armstrong, also collaborated closely with Educational Technology Services to expand technology infrastructure to several of roughly 20 classrooms without it. “More and more instructors are asking for classrooms equipped with supportive technology, and not just the traditional audio-video systems but blended IT-intensive multimedia capabilities,” says Owen McGrath, ETS technical-operations manager. The renovation of 102 Wurster Hall incorporated functional upgrades and ADA improvements while preserving the industrial aesthetic of the 1960s-era architecture and design building. The decades-old plastic seating and rickety writing tablets were replaced with spacious terrace-seating outfitted with power outlets and isle-side safety lighting for enhanced wayfinding. Sustainably sourced wood paneling in lush cherry tones and brushed-metal handrails complement the refinished concrete floor and steel-accented energy efficient lighting. An ADA-compliant power-operated door provides access to the newly created flexible seating area to the rear of the auditorium.